Mythically, Sweden makes two things exceptionally well: hot skirts and great pop/dance music (ABBA, The Knife, Jose Gonzalez, Miike Snow). 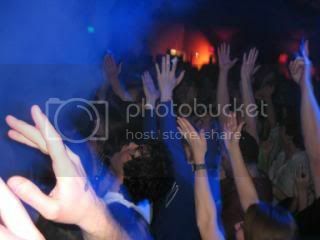 One of those exports, Little Dragon, played to an awed and attentive crowd Tuesday (4.6.10). Singer Yukimi Nagano enhanced nuances in songs that can only be witnessed in person and did it so well. These Swedes were also impeccably rehearsed and fully engaged, heightening the crowd’s already buzzing brains. Specific times at the concert were reminiscent of the artwork from the band’s second album, Machine Dreams, spaced-out and extra-ordinary. Urban Lounge’s LED array allowed Little Dragon to swim in color and Nagano wore a gauzy bit of fabric that doubled as a scarf and an aquatic bubble that she sang beneath for minutes⎯the kind of Minutes that flow differently in Little Dragon’s signature beat dips and swells. Nagano danced her being into physical, discernible existence with a shaker and amazing hips. Her mellow-jazz delivery and lingual caress of some good lyrics elevated her from mere “cute” girl in a band to a genuine diva, and I’ve seen a small amount of that kind on Urban’s planks. Another such emotive powerhouse was Sian Alice when her group came through and coincidentally both singers forego shoes on the Urban stage⎯a space shared by way too many metal bands to make it a sanitary practice. Perhaps this is a way for these singers to really feel rhythm and truly connect to the beat in a primal way. Or maybe Nagano’s feet were just hot. She appeared to have cute feet⎯all foot fetishists/Swedish-pop fans rejoice. Machine Dreams was where Little Dragon drew most of their live material from, thankfully, as it is far superior to their first effort (S/T). Their latest is a must acquire for fans of a Swedish pop combination of bands like The Knife and Laleh. I thought this show would sell out and with heavy doses of promotion from KRCL it was almost assured⎯I thought wrong. The smaller-than-deserved attendance made me truly sad for both the uninformed people in Utah, and those who left early for “greener pastures”⎯both assuredly only finding themselves in muddied fields, devoid of the nutrients in Little Dragon’s potent breath: puff puff. Urban Lounge sold out last Saturday night (4.10.10) for the much anticipated arrival of one of Sweden’s top dance bands. 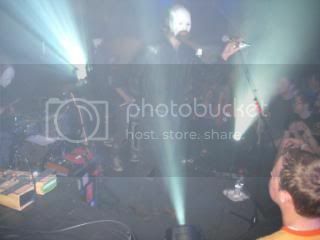 In perfect contrast to Little Drgaon, Miike Snow’s set began with a pre-recorded intro and laser lights/fog machines. The crowd, mostly douchebags, were so amped and sweaty it was hard to properly enjoy the mayhem. After stepping out for a breath of fresh air for a moment I tried to return into the venue but met with some friendly authority types with badges and the insistence that Urban was too crowded for me to return to. If they had not let me back into the Little Dragon show I would have hopped a fence. I wasn’t too upset at the Miike Snow refusal so I waited outside with a drunk guy who had been removed for serving himself beer from the tap. I later ran into this gentleman at a party as he was drinking a 40 of O.E. That guy, along with many more like him, and their polar opposites (the kids from Utah Valley) made for a bad experience of sweat and crowding. I would have been much more excited to see Miike Snow a year ago when their album first dropped and all the douchebags hadn’t jumped on the Snow train. A caveat here: I first heard the band through a remix of their song “Burial” by DJ Mehdi and think remixes of this group are really where it’s at. For the record, which is what this is, the band played very well⎯flawlessly, entered the stage in creepy, white masks and appeared to be enjoying the spectacle. 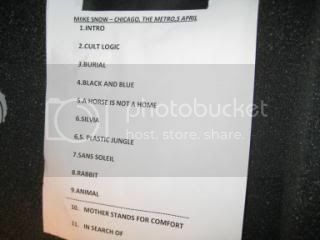 Check out the setlist pic, see what they played, listen to the album correspondingly, close your eyes and imagine fog, the most lasers ever seen at Urban Lounge, a douche circus and you will have the Miike Snow show in a bottle.